We all know that early learning includes the development of the pre-reading and math skills that children will need for school. However, preschoolers need to learn more than how to recite the alphabet and count; children also need to develop executive function skills. Executive functions help us control our thoughts, behavior and emotions, including our abilities to concentrate, focus, transition between activities, reason and plan. Other executive functions include working memory, organizational skills and cognitive flexibility. Children who develop these executive skills are more likely to do well in school. Goddard School teachers focus on helping children develop executive function skills throughout each day in purposeful and fun learning activities. We do this by encouraging play through dramatizations, stories and games that help young children to develop self-regulation, cognitive and social-emotional skills. Turn off your tablet or smartphone, and bring out toys that encourage imaginative play, such as blocks and clay. 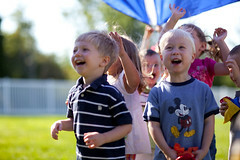 At The Goddard School®, we encourage children to use their inquisitive natures to explore, build and question. Through hands-on activities, children learn to ask questions, draw upon their existing knowledge, design experiments, make predictions about what might happen and draw conclusions, which is the scientific process. Lessons and play use math and technology every day. Children are natural engineers, and we encourage their creativity in our block, art and outside play areas. Creative art motivates and engages children in learning, stimulates memory, facilitates understanding, enhances symbolic communication, promotes relationships and provides an avenue for building competence. 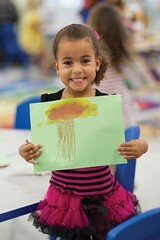 Encourage art at home as a family activity. Be creative with recycled materials. You can build a bird house from boxes and wood or a robot from cardboard, leaves and twigs. 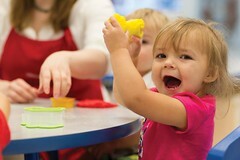 The children will be learning a lot and you will be creating wonderful family memories. Goddard Schools tested all of the activities for Susan Magsamen’s book The Classic Treasury of Childhood Wonders (2010) in our classrooms. The children and families had fun and loved being involved.